By Avneesh Chhabra, M.D., Christopher A. Cerniglia, D.O., M.Eng. 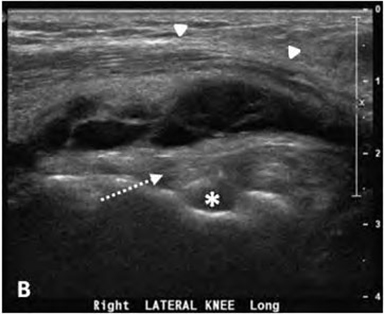 One of the more common imaging findings when evaluating the knee, whether by ultrasound or MRI, is the “cystic lesion.” These “cystic lesions” may be related to bursae, cysts, or other cyst-like lesions and could be soft tissue or intraosseous in origin. They are mostly benign lesions; however, not all hypoechoic or T2 hyperintense lesions are cysts, and neoplastic lesions may be missed if close attention is not paid to the typical imaging findings. Therefore, knowledge of the normal bursae, common cysts, and cyst-like lesions which can occur about the knee is essential for the appropriate diagnosis and management in these cases. In general, a bursa functions to reduce friction between two structures, at least one of which is moving relative to the other. Bursae can be divided into two types, anatomic and adventitial. Anatomic bursae are true synovial lined sacs which may be fluid-filled and located in expected positions near the joint. In contrast, adventitial bursae are not synovial lined and may occur away from the joint. 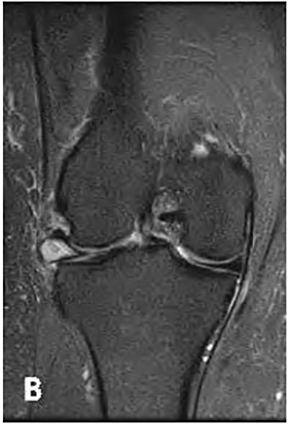 There are various bursae which are encountered during routine imaging of the knee. 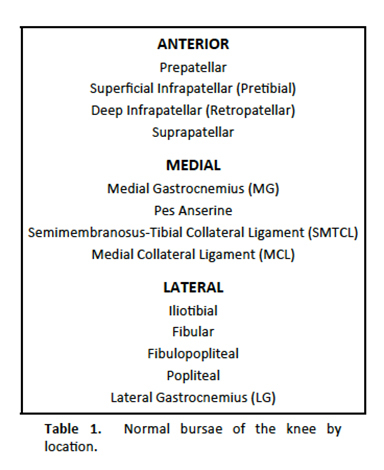 The bursae about the knee can be divided by location into anterior, medial and lateral (Table 1). These bursae can become distended from direct or repetitive trauma or secondary to local or systemic inflammatory changes. Bursitis can be further complicated by hemorrhage, rupture, synovial proliferation, chondromatosis, or infection. The iliotibial bursa is located deep to the distal iliotibial band proximal to its tibial attachment (Fig. 10) and may become distended in iliotibial band friction syndrome.2 Iliotibial band bursitis or iliotibial band syndrome is a common overuse injury in runners. 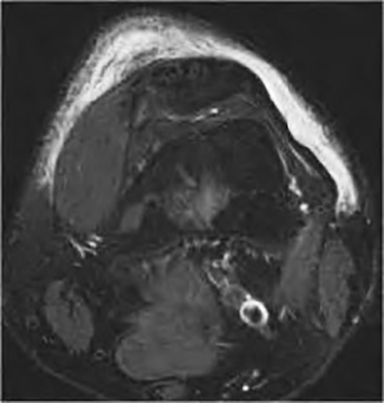 The fibular bursa is located between the fibular collateral ligament and the distal biceps femoris tendon (Fig. 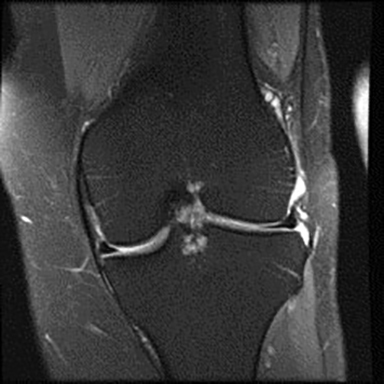 11).7 The fibulopopliteal bursa is contained between the fibular collateral ligament and the popliteus tendon. The popliteal bursa communicates with the joint and therefore may be referred to as the popliteal or subpopliteal recess (Fig. 12).8 This bursa extends between the popliteus tendon and lateral femoral condyle and in some individuals communicates with the fibulopopliteal bursa.9 The lateral gastrocnemius (LG) bursa is present between the lateral head of the gastrocnemius and joint capsule (Fig. 13). The gastrocnemius bursae and fibulopopliteal bursae will commonly become distended in chronic internal derangement of knee. In contrast to the anatomic bursae described which reside over normal anatomic areas of friction, the body may also produce bursae as a result of friction between a normal anatomic structure and a pathologic or iatrogenic friction point. 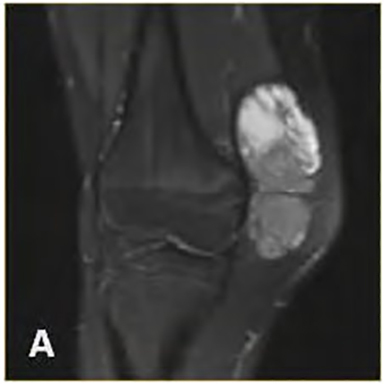 Some examples include adventitial bursae produced adjacent to an osteochondroma (Fig. 14) or orthopedic hardware. Popliteal cysts are specific types of synovial cysts which communicate with the joint through a rent in the posteromedial capsule; they insinuate between the medial head of the gastrocnemius and the tendon of the distal semimembranosus (Fig. 16). These synovial cysts are commonly associated with joint effusions and are present in up to 40% of patients with posterior knee masses. 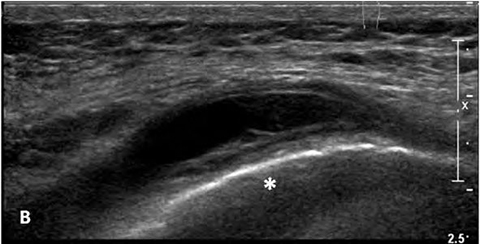 Popliteal cysts are associated with internal derangement, even in the absence of a joint effusion.10 Patients may present acutely secondary to rupture of the cyst. Popliteal cysts may be complicated by hemorrhage, inflammation, or loculation from chronic or partial decompression. Also, due to their communication with the underlying joint, popliteal cysts may at times contain loose bodies (Fig. 17). 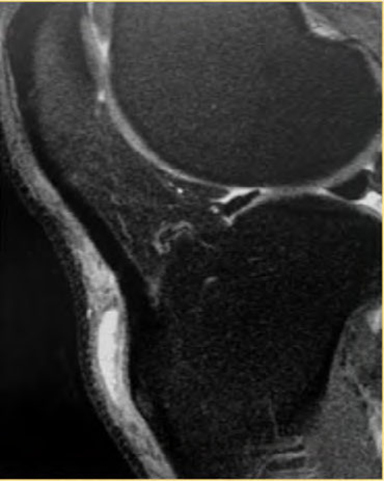 Parameniscal cysts are thought to be produced by the extension of joint fluid through a meniscal tear and into the adjacent parameniscal soft tissues (Fig. 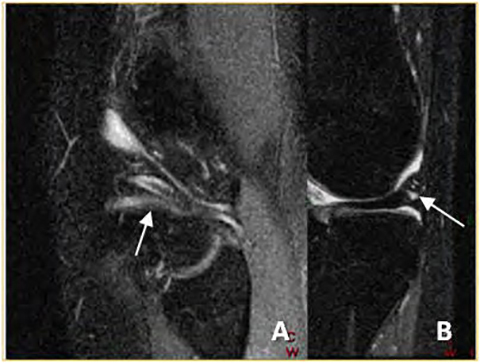 19).16 These cysts may extend long distances from the joint, mimicking sarcomas; however, the neck can often be traced to the joint line and the meniscal level. 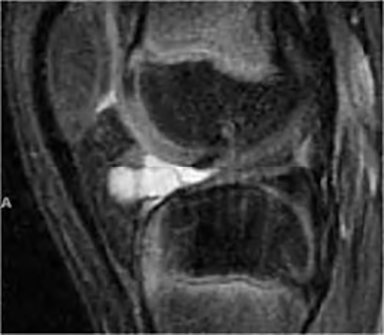 Pericruciate meniscal cysts are seen adjacent to the PCL and arise from tears in the posterior horn of the medial meniscus.17 This particular location of a parameniscal cyst may be confused with a PCL ganglion. 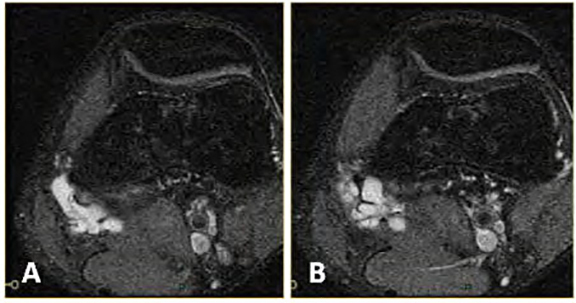 It is critical to differentiate the parameniscal cysts from PCL ganglia as the treatment approaches will often differ. 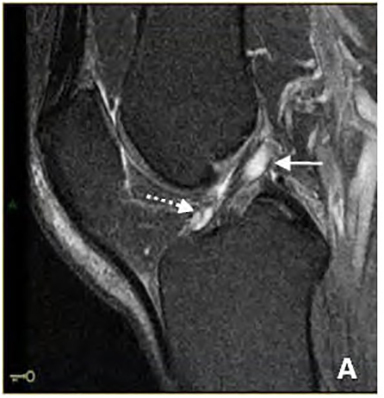 Additionally, while parameniscal cysts reflect an underlying meniscal tear, cruciate ligament ganglia are not associated with tears of the ACL or PCL, but rather reflect chronic mucoid degeneration from micro-injuries. In general, most ganglion cysts are found in locations which are under constant stress. 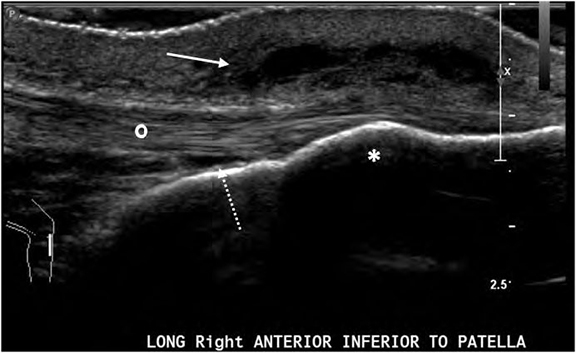 Although somewhat controversial, one common explanation for the formation of ganglion cysts is that they are the result of mucoid cystic degeneration in collagenous structures.4,18 This degeneration produces a cyst with a well-defined fibrous capsule and highly viscous fluid internally, which will typically be demonstrated by intermediate or intermediate low T1 and high T2 signal.2,19 Intra-articular ganglia may be extrasynovial but intracapsular, commonly arising from the alar folds of either the infrapatellar fat pad or cruciate ligaments. Since patients with intra-articular ganglia often present with pain or locking and the lesions may mimic sarcoma, identification of these ganglia is of clinical importance. 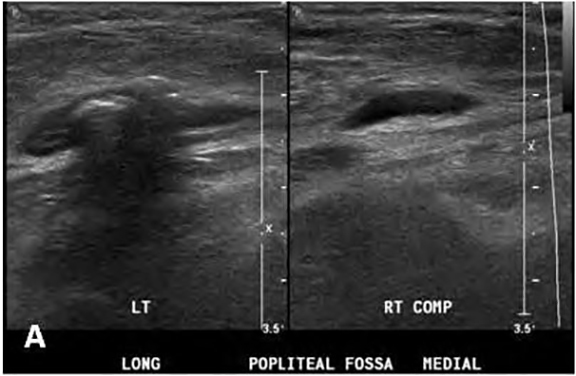 Contrast examination aids in differentiation of these lesions (peripheral enahancement) from malignancy (central, nodular peripheral, or solid enhancement) when the cyst is in an atypical location or the diagnosis is uncertain. These intraosseous cystic lesions are typically located at the attachment of the cruciate ligaments or meniscotibial attachments (Fig. 25).2 Like soft tissue ganglia, insertional cysts and intraosseous ganglia are believed to be the result of chronic degeneration. 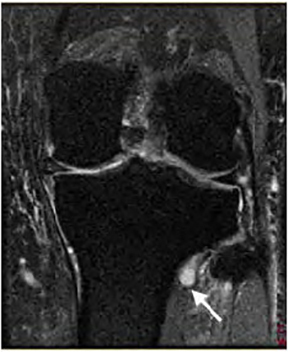 Insertional cysts, also known as avulsive cystic changes, are formed by chronic tensile stress at the attachment of ligaments or menisci, producing focal necrosis and cyst formation.28 In the case of intraosseous ganglia, abnormal stress within the bone undergoes mucoid degeneration.28 Less commonly, these ganglia may result from extension of an adjacent soft tissue ganglia.29 The appearances of these degenerative intraosseous cysts are similar to the subchondral cyst, differing only on imaging by a location which is not subchondral. There are a variety of cyst-like lesions which may mimic cysts depending on the modality utilized. Etiologies of these lesions include vascular, traumatic, infectious, and neoplastic. Vascular lesions and normal and abnormal vascular structures may mimic cystic masses. The popliteal artery aneurysm or pseudoaneurysm is distinguished by its location and flow void. Slow flow lesions include popliteal vein varices, superficial varicosities (Fig. 26), lymphatic malformations, mixed venolymphatic malformations, and hemangiomas. Hemangiomas are rare in adults and should have an enhancing soft tissue mass. Most commonly, it is a slow flow venous malformation (Fig. 27) that is mistakenly referred to as a hemangioma. 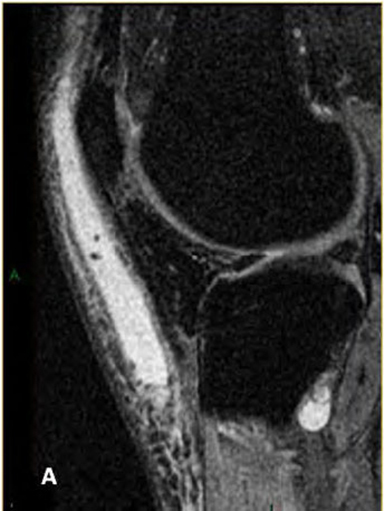 Normal vessels in and around the knee may occasionally be mistaken for cyst-like lesions (Fig. 28), depending upon the flow and signal intensity within the vascular structure. An understanding of the vascular anatomy and following the course of the vessel will help avoid this potential pitfall. 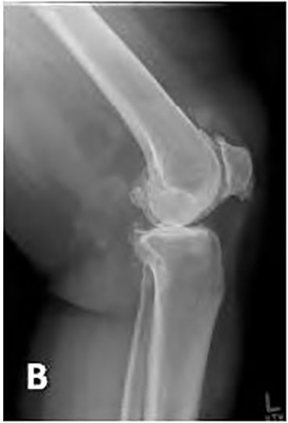 Fluid collections from trauma or infection may occur around the knee. The clinical findings are helpful in arriving at the definitive diagnosis. However, imaging clues include T1 shortening from blood products in hematoma versus diffuse fascial edema and enhancement noted with abscesses. These lesions should be followed to resolution clinically and/or by imaging. Expanding lesions may need further assessment with contrast to exclude underlying malignancy. Of note, a degloving lesion may persist in the soft tissues for prolonged periods in the fascial or subcutaneous layers of the knee (Fig. 29). First identified by French surgeon Morel-Lavallée in 1863, the post-traumatic soft tissue degloving injury was originally described as occurring in the soft tissues of the proximal thigh over the greater trochanter.30 Closed degloving lesions most commonly occur adjacent to bony protuberances. They form as a result of direct or tangential shearing forces which separate the skin and subcutaneous tissues from the underlying fascia forming a potential space which can fill with blood, lymph and/or fat.31-33 Degloving lesions can be identified by their well defined oval or fusiform shape and tapering margins which merge with the subjacent fascia. These lesions may show fluid-fluid levels, septations, and variable internal signal intensities dependent on the concentration of hemolymphatic fluid and age of the lesion. 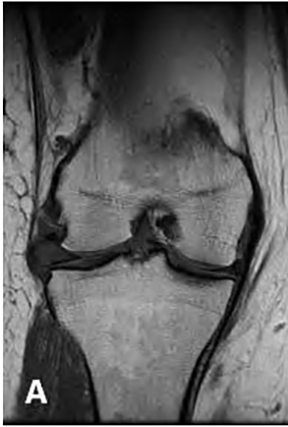 To conclude, a variety of bursae, cysts, and cyst-like lesions exist about the knee joint, many of which have fairly characteristic locations and imaging features. Knowledge of these variants and lesions is essential for accurate diagnosis and to avoid mistaking them for aggressive soft tissue lesions, including sarcomas. Steiner E, Steinbach LS, Schnarkowski P, et al. Ganglia and cysts around joints. Radiol Clin North Am 1996; 34: 400-410. Janzen DL, Peterfy CZG, Forbes JR, et al. 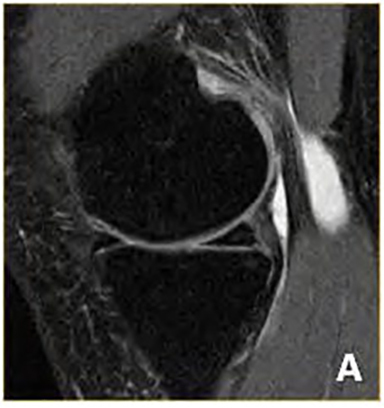 Cystic lesions around the knee joint: MR imaging findings. AJR Am J Roentgenol 1994; 163: 155-161. LaPrade RF. 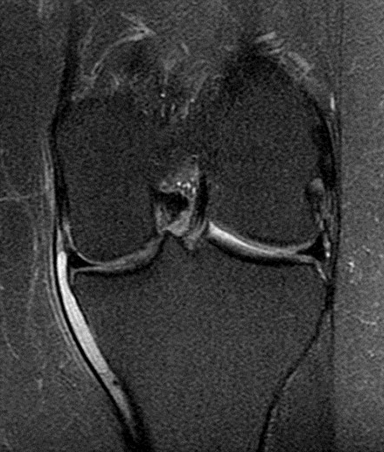 The anatomy of the deep infrapatellar bursa of the knee. Am J Sports Med 1998; 26: 129-132. McCarthy CL, McNally EG. 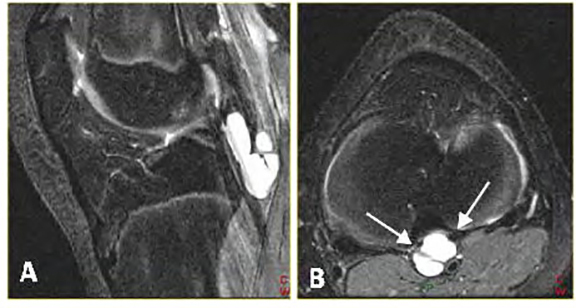 The MRI appearance of cystic lesions around the knee. Skeletal Radiol 2004; 33: 187-209. 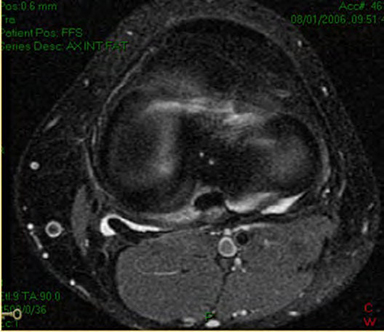 Butler MG, Fuchigami KD, Chako A. MRI of posterior knee masses. Skeletal Radiol 1996; 25: 309-317. De Maeseneer M, Shahabpur M, Vanderdood K, et al. 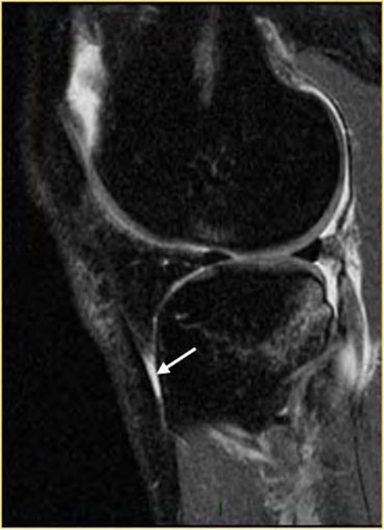 MR imaging of the medial collateral ligament bursa: findings in patients and anatomic data derived from cadavers. AJR Am J Roentgenol 2001; 177: 911-917. LaPrade RF, Hamilton CD. The fibular collateral ligament-biceps femoris bursa. An anatomic study. Am J Sports Med 1997; 25: 439-443. Kaplan, PA. Chapter 15: Knee. In: Kaplan, PA, D A, Helms CA, et al. 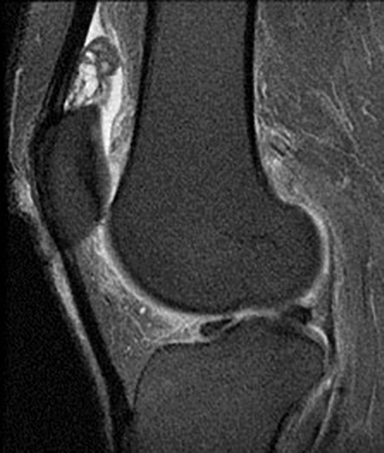 Musculoskeletal MRI, 1st ed. Philadelphia: SaundersÂ¬2001: 376-381. Burgener, FA. Chapter 10: Knee. In: Burgener FA, Meyers SP, Tan BK, et al. Differential Diagnosis in Magnetic Resonance ImagingYou +1'd this publicly. .Undo 1st ed. New York: Thieme; 2002: 390. Miller TT, Starson RB, Koenigsberg T, et al. 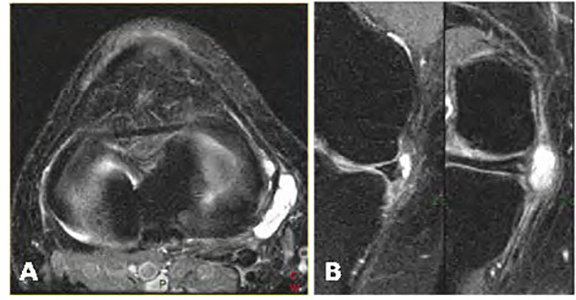 MR imaging of Baker cysts: association with internal derangement, effusion and degenerative arthropathy. Radiology 1996; 201: 247-250. Torreggiani WC, Al-Ismail K, Munk PL, et al. 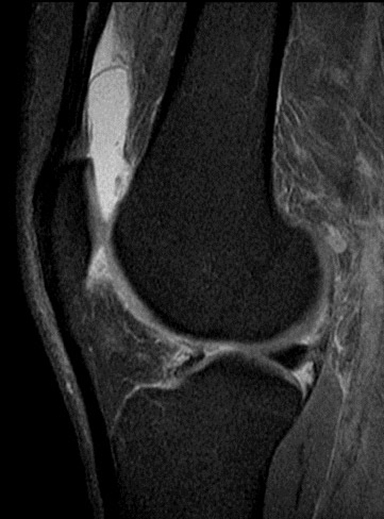 The imaging spectrum of Bakerâ€™s (popliteal) cysts. Clin Radiol 2002; 57: 681 -691. 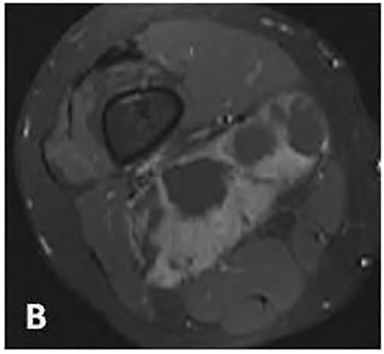 Handy JR. Popliteal cysts in adults: a review. Semin Arthritis Rheum 2001; 31: 108-118. Damron TA, Rock MG. 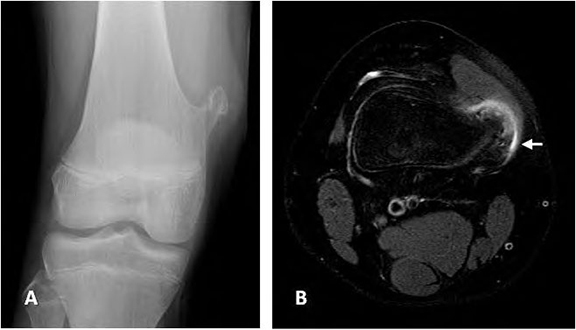 Unusual manifestations of proximal tibiofibular joint synovial cysts. Orthopaedics 1997; 20: 225Â¬230. Chalian M, Soldatos T, Faridian-Aragh N, et al. MR evaluation of synovial injury in shoulder trauma. Emerg Radiol. 2011;18: 395-402. Lektrakul N, Skaf A, Yeh LR, et al. 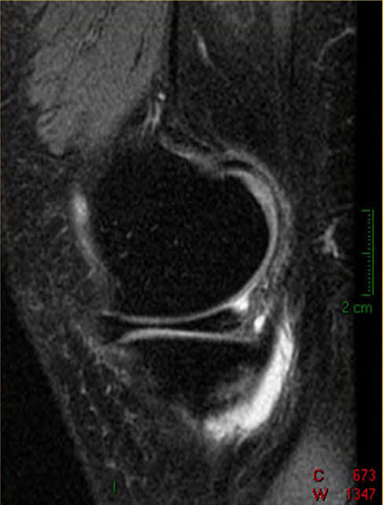 Pericruciate meniscal cysts arising from tears of the posterior horn of the medial meniscus: MR imaging features that simulate posterior cruciate ganglion cysts. AJR Am J Roentgenol 1999; 172: 1575Â¬1579. Tyson LL, Daughters TC, Ryu RKN, et al. 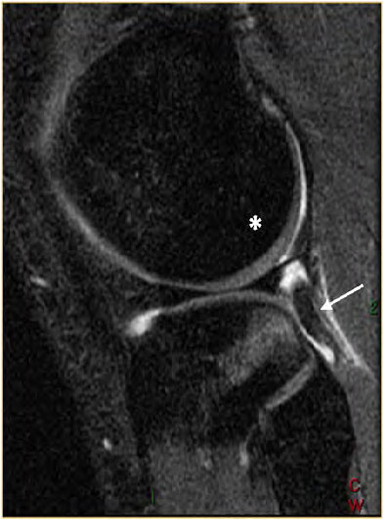 MRI appearance of meniscal cysts. Skeletal Radiol 1995; 24: 421-424. Bui-Mansfield LT, Youngberg RA. 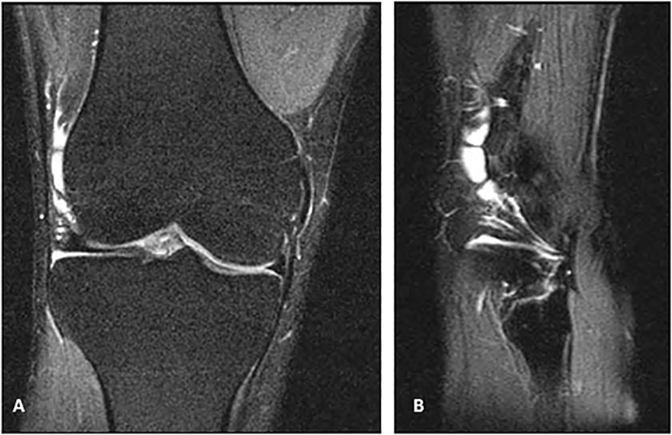 Intraarticular ganglia of the knee: prevalence, presentation, etiology, and management. AJR Am J Roentgenol 1997; 168: 123-127. Recht MP, Applegate G, Kaplan P, et al. 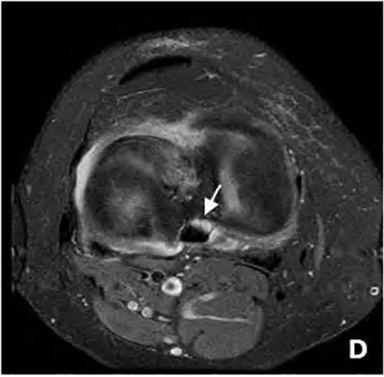 The MR appearance of cruciate ganglion cysts: a report of 16 cases. Skeletal Radiol 1994; 23: 597-600. Malghem J, Vande Berg BC, Lebon C, et al. 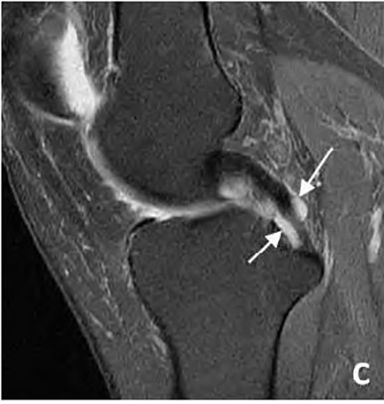 Ganglion cysts of the knee: articular communication revealed by delayed radiography and CT after arthrography. AJR Am J Roentgenol 1998; 170: 1579-1583. Kim MG, Kim BH, Choi JA, et al. 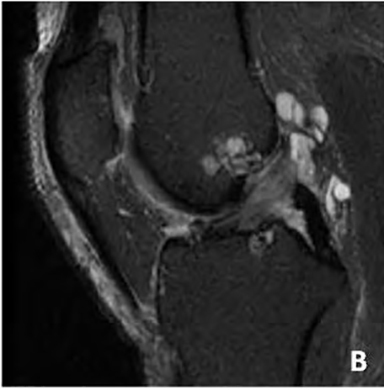 Intraarticular ganglion cysts of the knee: clinical and MR imaging features. Eur Radiol 2001;11:834-840. 2Chhabra A, Subhawong TK, Carrino JA. 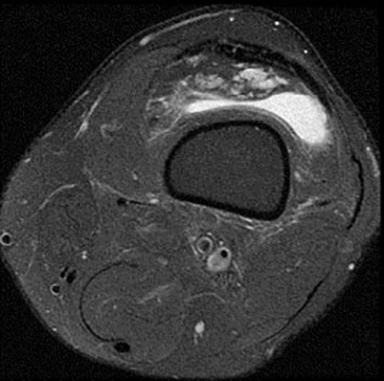 A systematised MRI approach to evaluating the patellofemoral joint. Skeletal Radiol 2011; 40: 375-87. Vahlensieck M, Linneborn G, Schild H, et al. 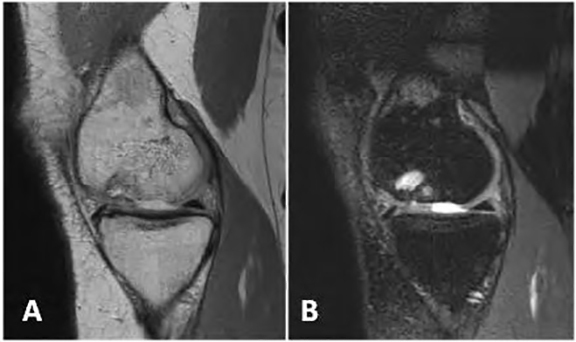 Hoffaâ€™s recess: incidence, morphology and differential diagnosis of the globular shaped cleft in the infrapatellar fat pad of the knee on MRI and cadaver dissections. Eur Radiol 2002; 12: 90-93. 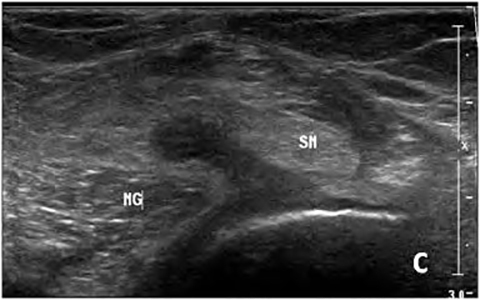 Feldman F, Johnston A. Intraosseous ganglion. AJR Am J Roentgenol 1973; 182: 328-342. McLaren DB, Buckwalter KA, Vahey TN. The prevalence and significance of cyst-like changes at the cruciate ligament attachments in the knee. Skeletal Radiol 1992; 21: 365-369. McCarthy EF, Matz S, Stiener GC, Dorfman HD. Periosteal ganglion: a cause of cortical bone erosion. Skeletal Radiol 1983; 10: 243-246. Mallado JM, Bencardino JT. 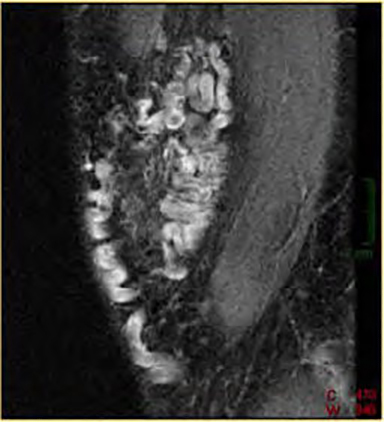 Morel-Lavallee lesion: review with emphasis on MR imaging. Magn Reson Imaging Clin N Am. 2005; 13: 775-782. Hak DJ, Olson SA, Matta JM. Diagnosis and management of closed internal degloving injuries associated with pelvic and acetabular fractures: the Morel-Lavallee lesion. J Trauma. 1997; 42: 1046-1051. Parra JA, Fernandez MA, Encinas B, Rico M. Morel-Lavallee effusions in the thigh. Skeletal Radiol 1997; 26: 239-241. Tejwani SG, Cohen SB, Bradley JP. Management of Morel-Lavallee lesion of the knee twenty-seven cases in the National Football League. Am J Sports Med 2007; 35: 1162-1167. Murphy MD, Gibson MS, Jennings BT, et al. 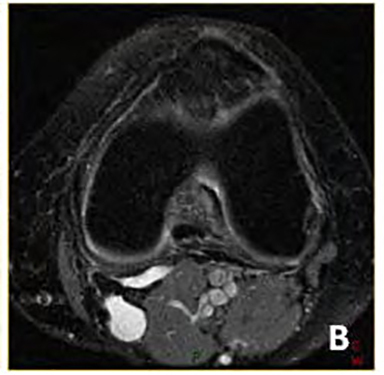 Imaging of Synovial Sarcoma with radiologic-pathologic correlation. RadioGraphics 2006: 26; 1543-1565. Chhabra A, Cerniglia CA. Bursae, Cysts and Cyst-like Lesions About the Knee . J Am Osteopath Coll Radiol. 2013;2(4):2-13. Avneesh Chhabra, M.D., Christopher A. Cerniglia, D.O., M.Eng. Dr. Chhabra works with the Division of Musculoskeletal Imaging, Department of Radiology, UTSW, Dallas, TX and Dr. Cerniglia works with the Division of Musculoskeletal Imaging, UMass Memorial Medical Center, Worcester, MA.